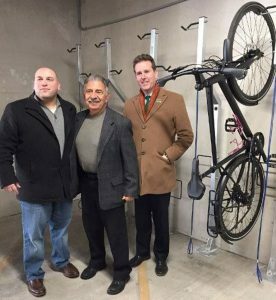 New Jersey Bike and Walk Coalition opened a bike depot on March 24th at Bloomfield’s Glenwood Avenue Parking Garage, steps away from the NJ Transit train station. The organization’s first bike depot opened two years ago at Montclair’s Bay Street Station. The Montclair depot can accommodate up to 24 bicycles and is near capacity! A third depot is planned for Elizabeth’s Midtown Garage in late summer. Bike depots provide safe, secure and weather-protected parking and storage. The Bloomfield depot is equipped with 38 racks, and features a repair station for minor bike maintenance. Click here to read more about the Bloomfield Bike Depot.